I've been teaching workshops out at Pt. Reyes for several years, and have enjoyed the immersion into that particular landscape, as well as the camaraderie with the students that comes with a weekend adventure, painting and cooking together. This one is coming up in a few weeks, and I still have a few spots left. We will be staying at the Historic Lifeboat Station, an old Coast Guard Barracks, way, way out on the point, near Chimney Rock and the Lighthouse. 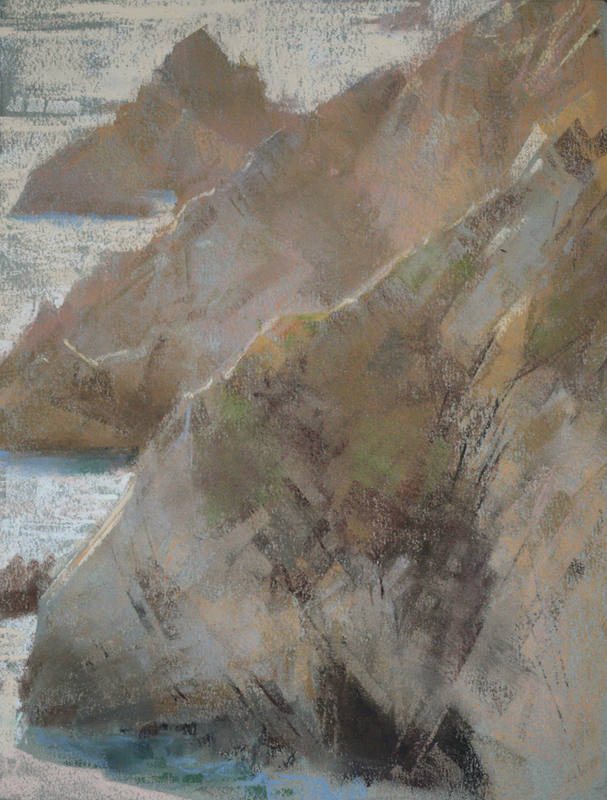 Cliffs, cypress, seals, rolling hills, deer, cattle, and the ocean are right outside the door, so to speak. Go here for more information, and to sign up. A group of 8 artists, Paul Kratter, Terry Miura, Ernesto Nemesio, Michelle De Bragança, Robert Steele, Lori Putnam, and myself, hiked and rode up to (drunken) Sailor Lake in the Sabrina basin in late August. It was a bit of a long grind going up. But, no one was hung over, nor was it raining, so much better than some other years. I am not in great shape though, and the higher elevation of this spot really had an effect. At 11,000', I could only plod very slowly on any incline. If I went any quicker, I simply could not breathe and keep moving. Its pretty humbling. One lesson I learned years ago on these hikes was that I usually could not enjoy much of the view while moving, as I needed to constantly pay attention to where my feet were, to avoid falling on my face, so stopping in order to breathe was a great way to appreciate the scenery as we climbed out of the lake basin. We hiked around towards the back side of Sabrina, roughly level, among many small aspens, and then began to ascend, via switchbacks, and some long, steep inclines over talus slopes, crossing several watercourses along the way. The hikers at the Sabrina trailhead. 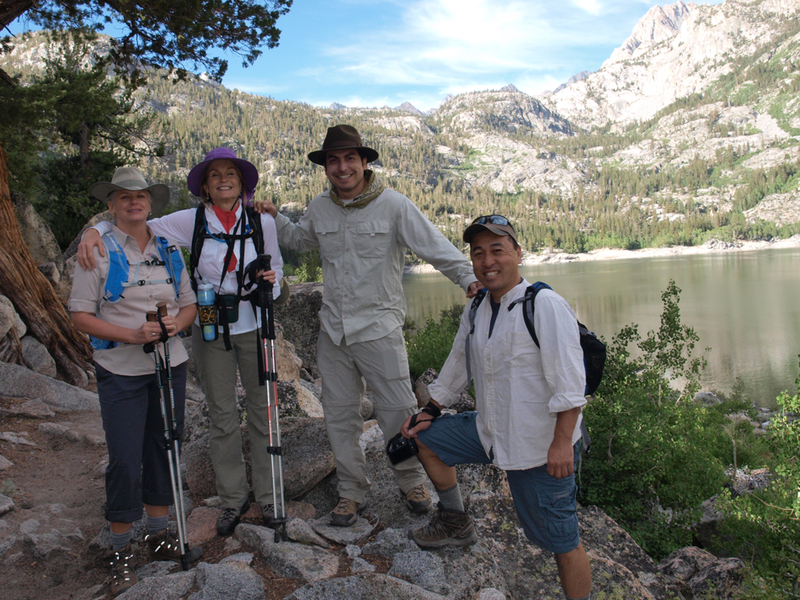 L-R: Lori Putnam, Michelle De Bragança, Ernesto Nemesio, and Terry Miura. After a few hours of huffing and puffing the point of view begins to change. 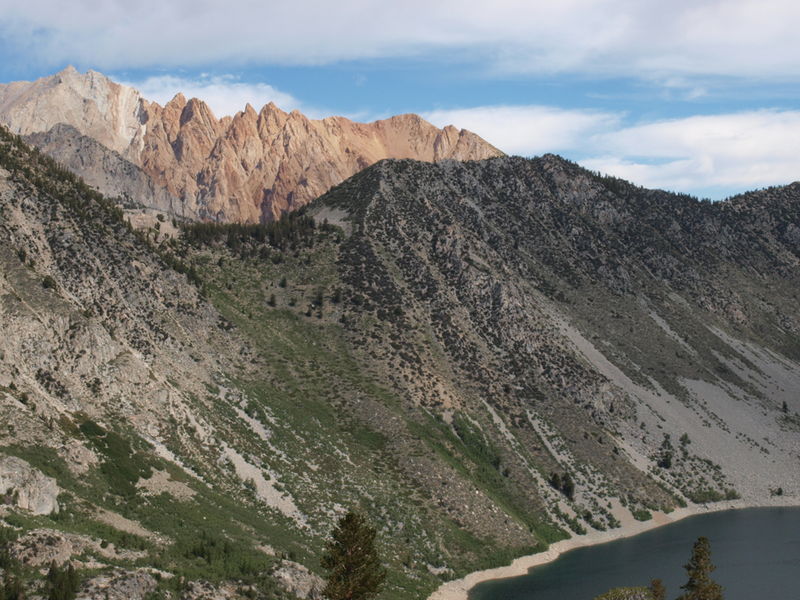 Those are the Piute Crag looming behind the Lake Sabrina basin. Less than halfway there, but progress! About 3 miles in, after surmounting the back wall of the basin, we arrived at Blue Lake, which looked good enough to make us wonder why we needed to go any further, yet we were only half way to our destination. 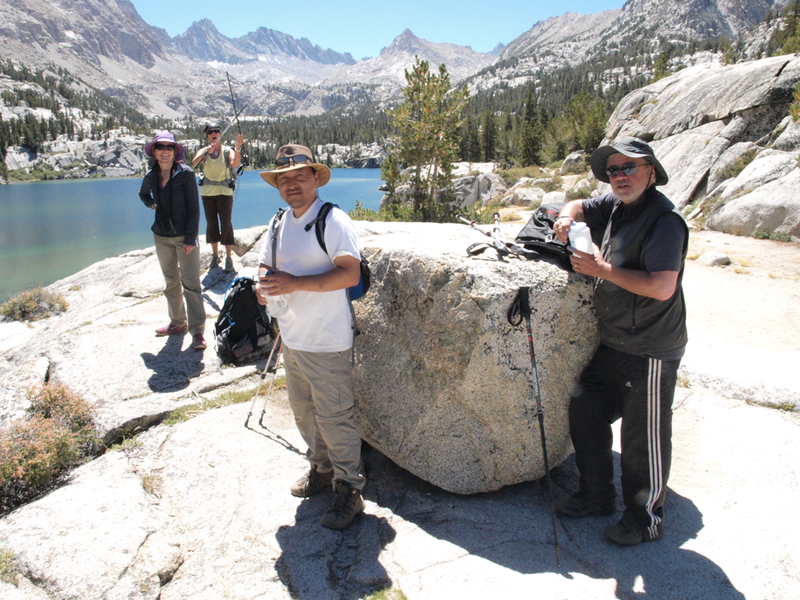 We stopped for lunch and a rest, then continued our upward journey through fox tail pines, amid a landscape dotted with huge erratic boulders, granite benches, walls, and numerous small ponds. 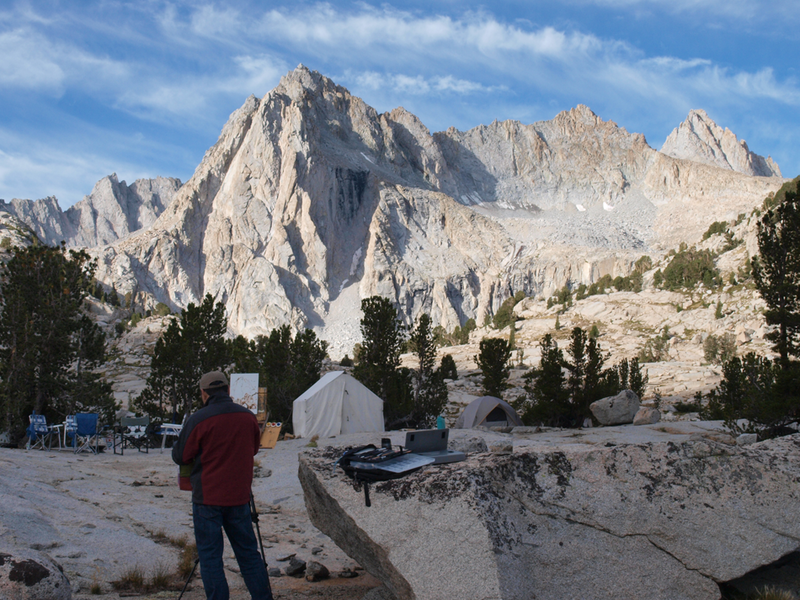 We often found ourselves hiking over acres of solid granite, with the trail being marked by stones on either side. At Blue Lake (actually shot on the hike out). Pretty nice scenery and water here. 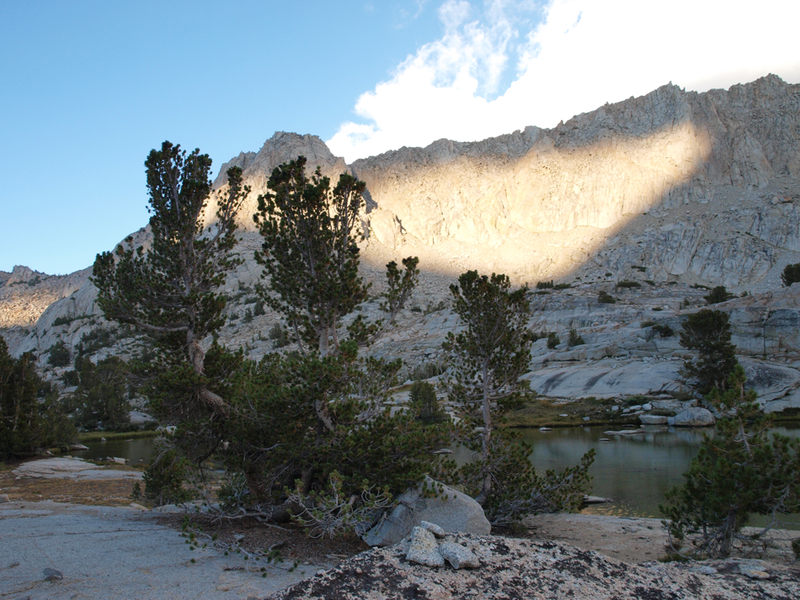 The mules had passed us at Blue Lake, so the 5 of us that elected to hike in, were strung out somewhere behind them. I straggled into camp in the late afternoon, met the cook, Ally, and her grandfather, Jerome, who was helping her out. They had a full on cook tent, that looked like a small house, with a metal frame, heavy canvas walls, and a large supply of propane tanks for cooking and heating. I grabbed my gear from the tarp, set up my tent, and started to survey the landscape possibilities. 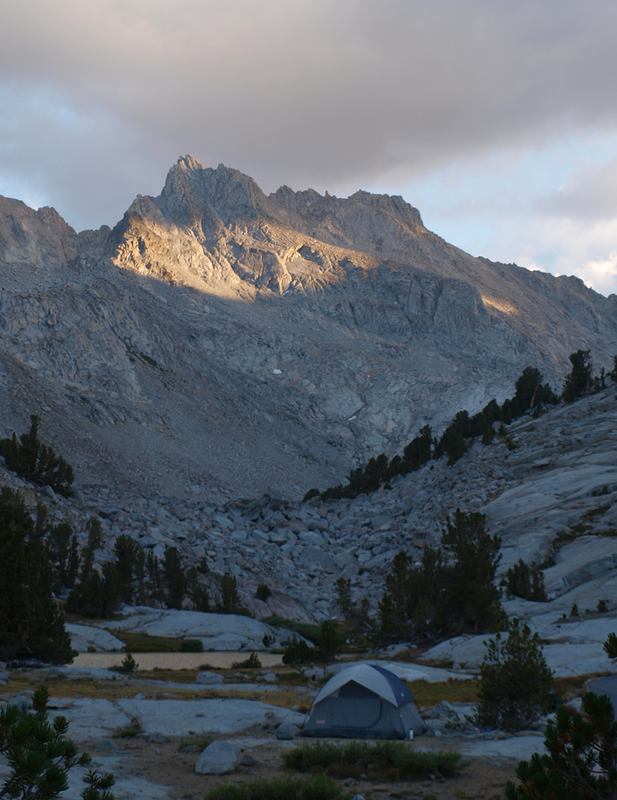 The view from camp towards Picture Peak. Mt. Haekel on the right, and Clyde Spires over the left shoulder. The cook 'house' to the right of Terry Miura. We were camped on the shores of Sailor Lake, which was, in my mind, more of a very shallow, meandering pond, in a descending glacial basin. About a quarter mile 'up' the basin to the west, was Hungry Packer Lake, out of sight over the U shaped ground plane that ended visually in the rocky slopes of Picture Peak, a ragged pyramid that dominated the skyline in that direction. To our left, was a small waterfall, fed from the outlet to Moonlight Lake, which could be reached by a short scramble. A curving wall of cracked granite flanked our north, dotted with small trees, over which some larger crags were visible. If we looked roughly east, down the basin, towards the desert floor, we could see the White Mountains glimmering faintly miles away, while the sloping foreground was a series of ponds, stands of pines, and boulders, which ended in Topsy Turvy Lake. The rest of our horizon was ringed with jagged escarpments and shattered rock slopes, well above the tree line. 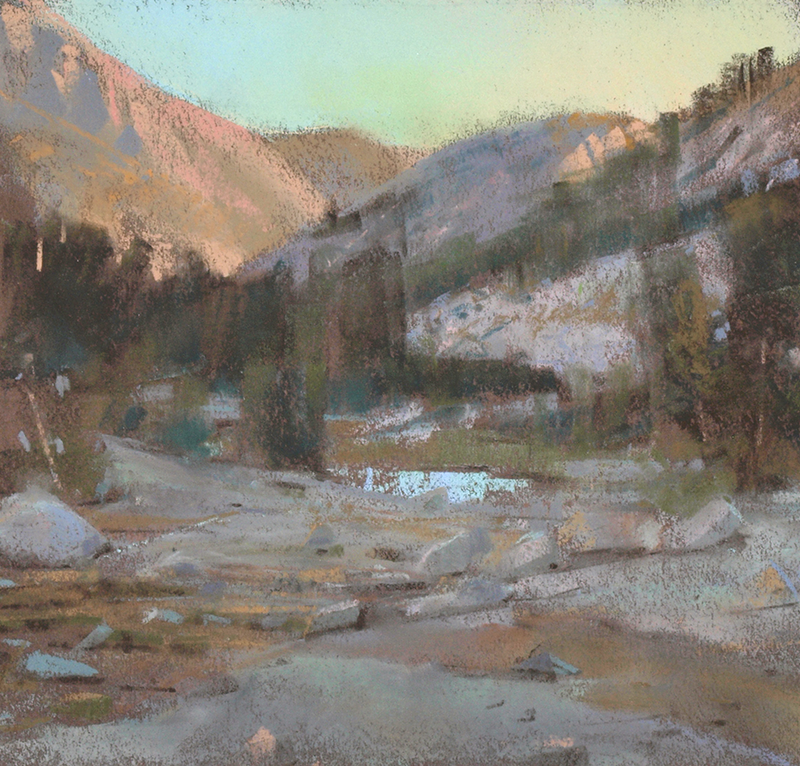 A study looking down the basin in morning light. 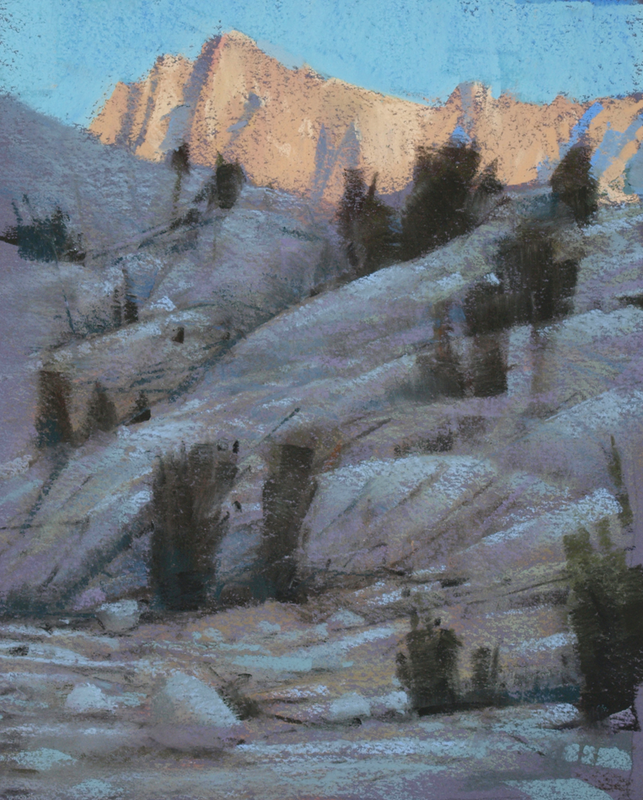 6 x 9", pastel on paper. 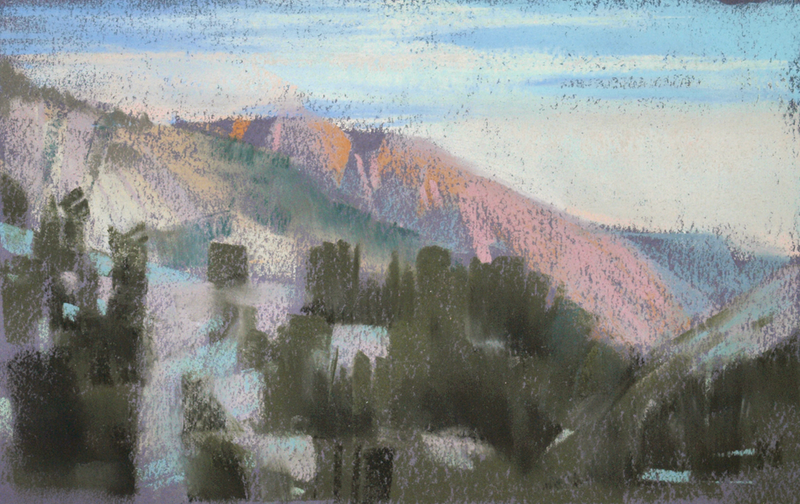 Here's a wider view, looking the same direction, painted on the last morning of the trip. 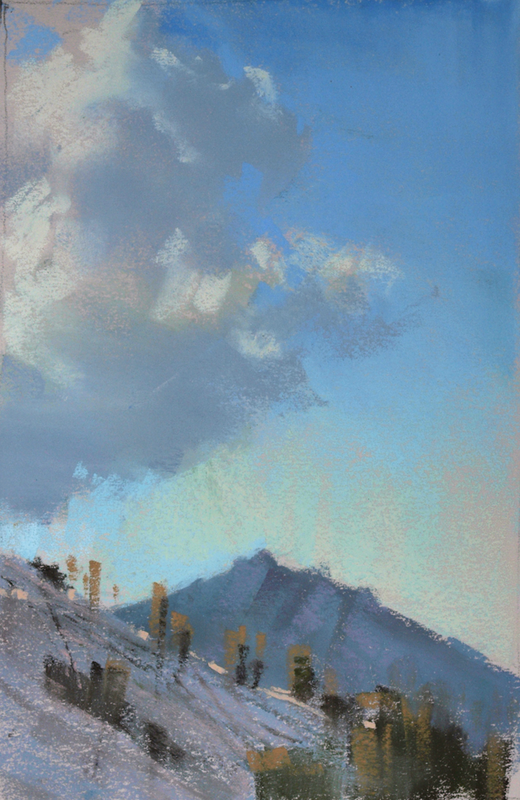 9 x 9.5", pastel on paper. 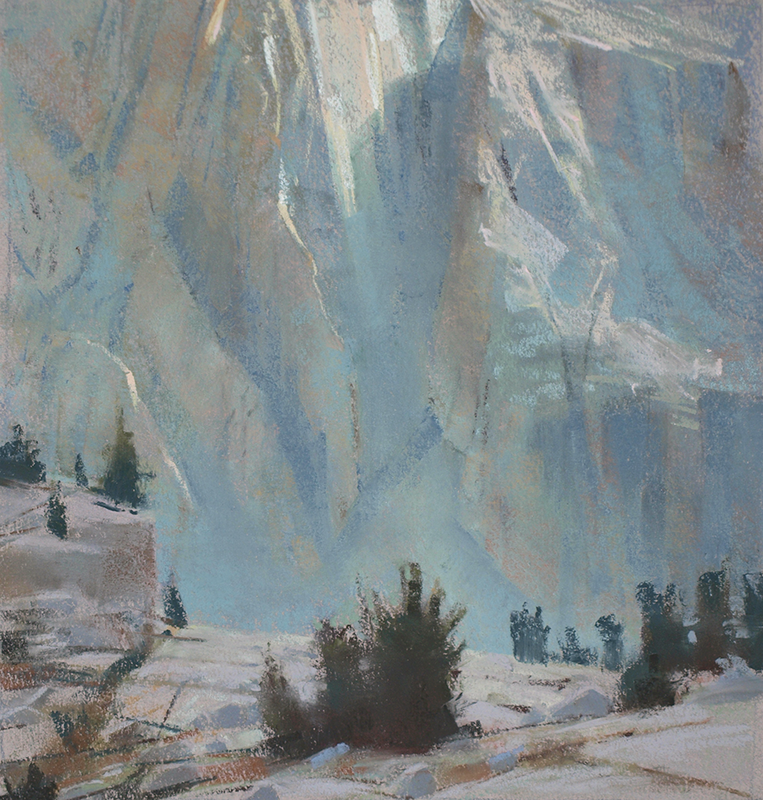 Charles Muench, who painted at this spot last year, had advised Paul and I that he felt the scenery was dominated by this singular view of Picture Peak. As a result, I deliberately avoided painting this view all week, though I did paint parts of the mountain. Others, however, went at the peak every morning from sunrise on. 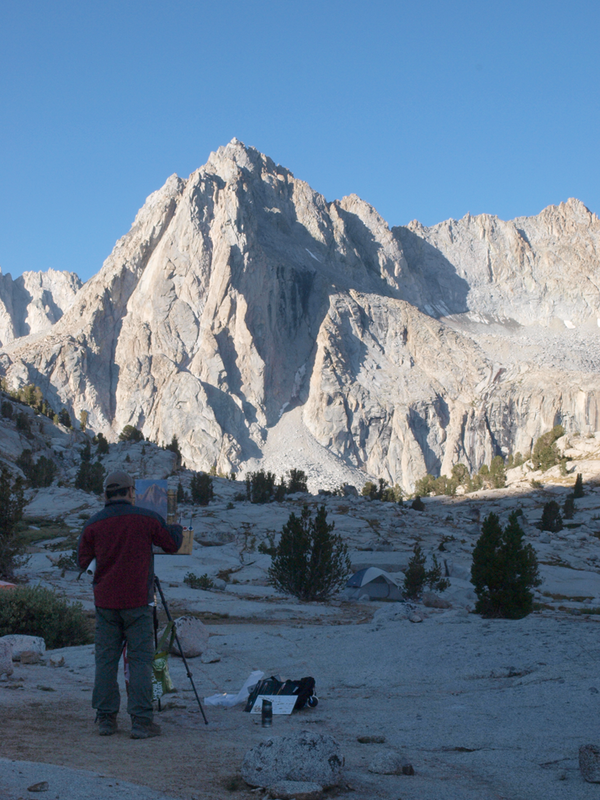 It was very convenient to paint from camp in the morning, as we were served hot coffee at our easels by Jerome. Quite a luxury in such a location. 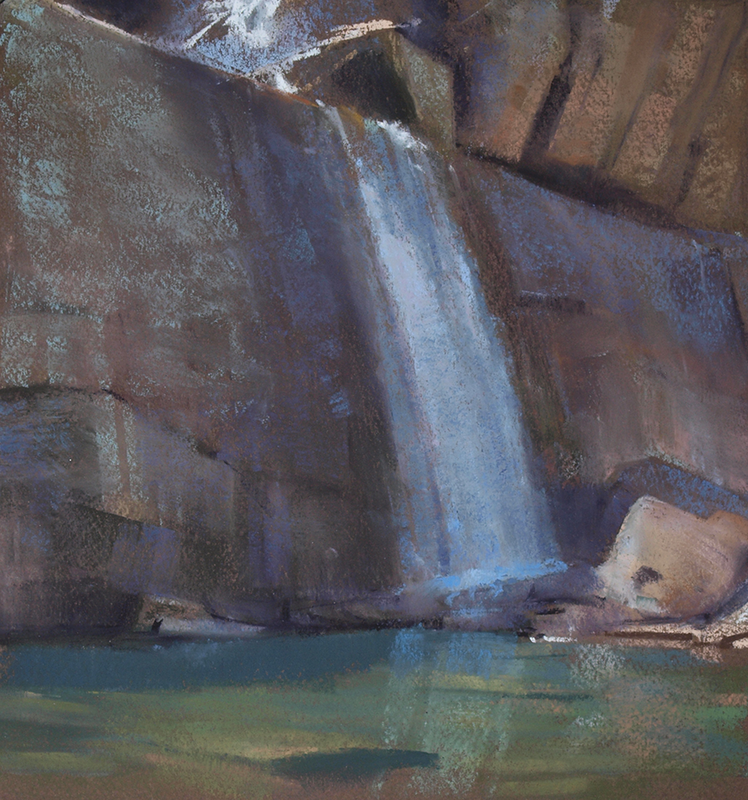 Here's an example of painting just a part of Picture Peak, emphasizing atmosphere and scale relationships. Not painting the 'thing' or the object, but elements or aspects that can make for an interesting painting. 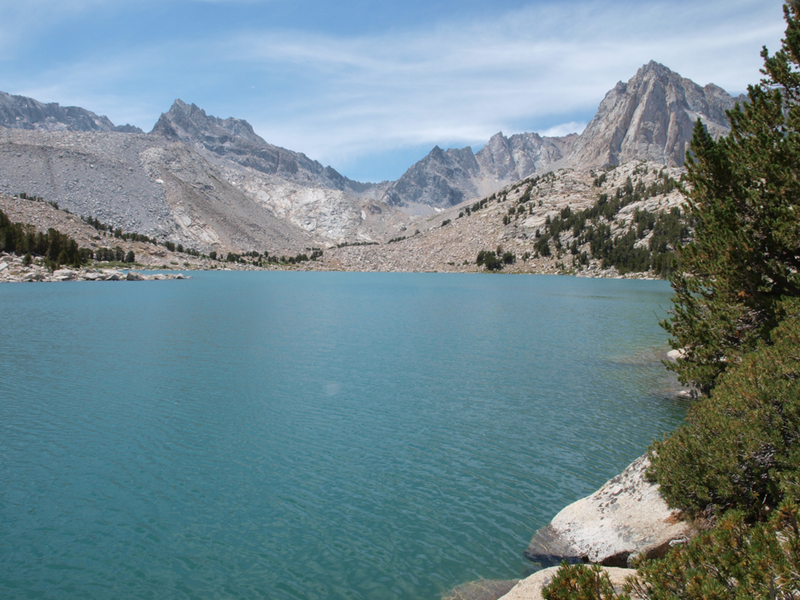 The first lake outside of camp that we visited was Moonlight lake, which was a 10 minute scramble to the south. It was big, deep, and unusually turquoise. Ernesto and I painted there one cloudy afternoon, then returned one sunny morning with everyone for a delightful day of painting, and even a little swimming, though it was too cold to stay in very long. 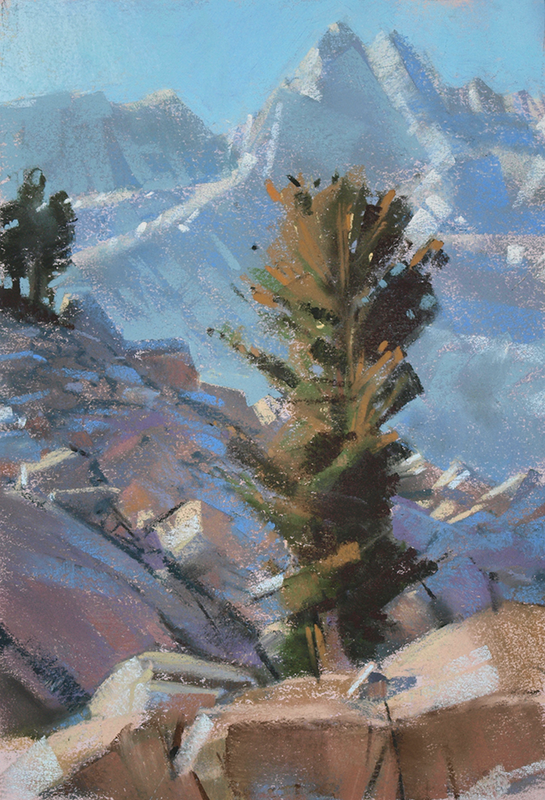 My first painting from Moonlight Lake. The clouds built up pretty quick, but small spots of light would would periodically glow and drift amongst the peaks. This is a view of Clyde Spires, which is visible in the photo above, to the left of Picture Peak. I usually don't do very wide views, and this is a good example of how a small section of a scene will suit me. A great day at Moonlight Lake. 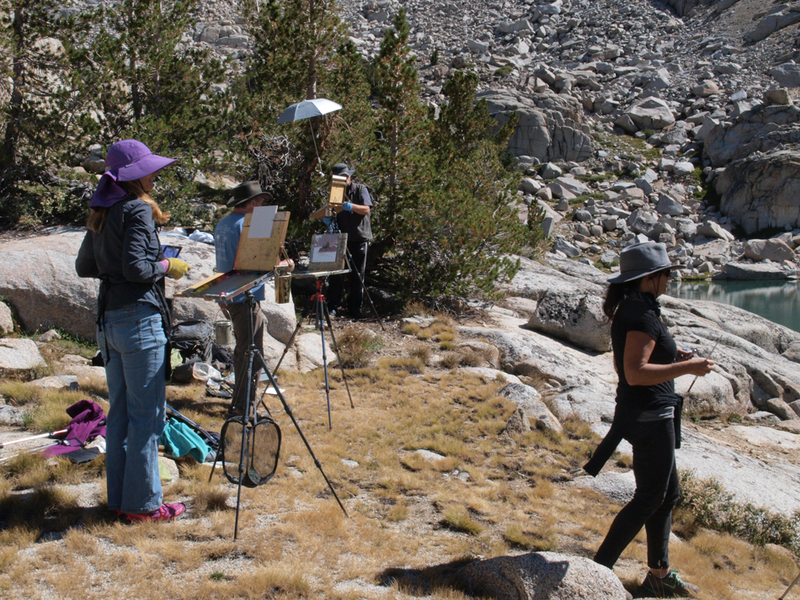 We are often on our own, so it is rare, and fun when everyone is in the mood to paint at the same spot. 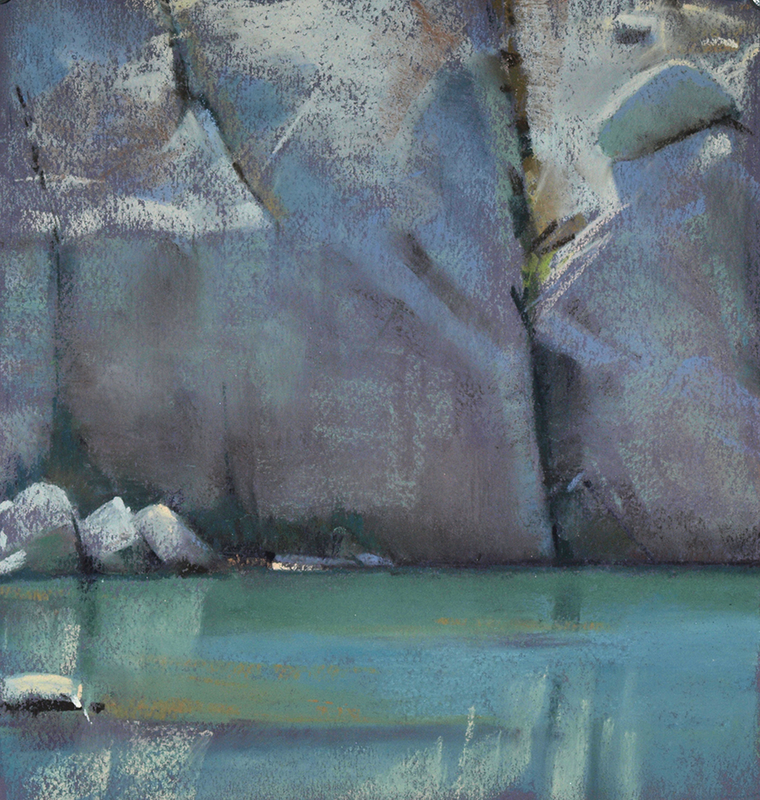 The south shore of the lake nearest us was full of boulders and cliffs that ran down into the turquoise water. I picked a small section of that to paint. We had several consecutive days of cloud build up that threatened a big downpour, yet we never had rain, just masses of cumulus looming over the peaks to the west, then dissipating towards the desert to the east. The edge of this mass would swell and retreat for hours, constantly shifting in form and color. 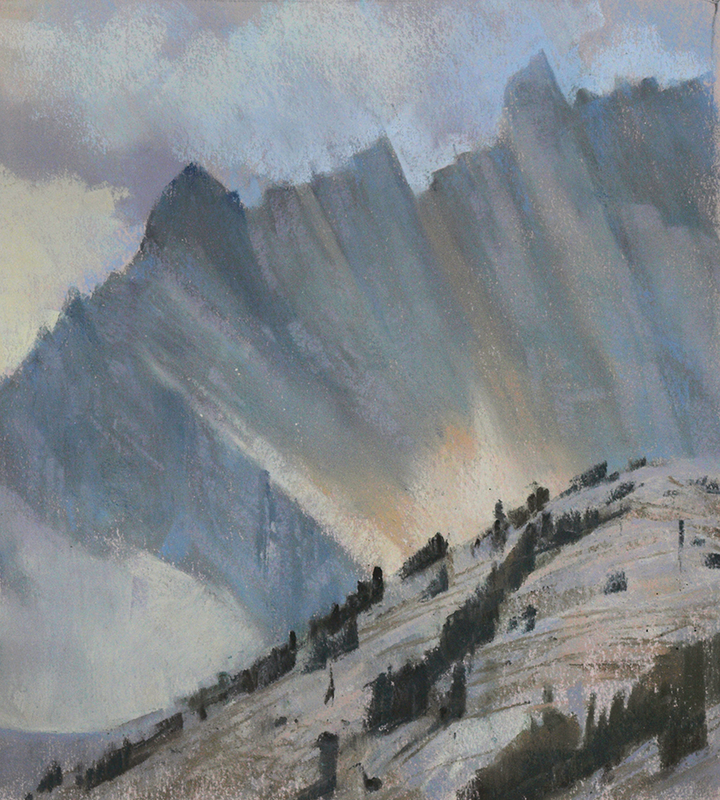 In the evening the clouds would create enormous variations of light and shadow patterns on the peaks, from ridiculous and unpaintable to sublime 19th century evocations, channeling Bierstadt and his ilk. We had one day of wind on the trip that just wore us out. It started blowing around 5 am, and did not quit until around 9 that night. Gust were strong enough to demolish one person's tent. I don't know how my cheapo, Big 5 dome tent held up, but it did. Maybe because I piled rocks at all 4 corners to hold down the poles. I still did 2 paintings that day. I put rocks in my tripod bag and hung it from the center post to keep everything from blowing over. No umbrella was possible. I just faced towards the sun, and held a board up with one hand to shade my colors, or huddled near cliffs and trees, to keep the light off my work. People think we are in some kind of paradise up there, but it can be really difficult conditions to work in at times. The first painting of the day in strong, gusting wind. 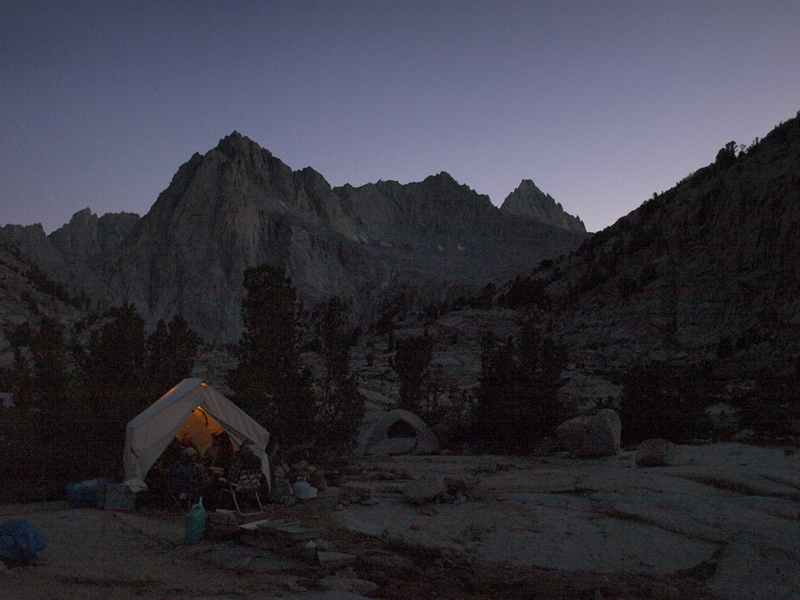 The wind blew until well after sunset, so we all crammed into the cook's tent on the last night, which was the best thing ever. It was toasty in there. Nothing like suffering all day, then celebrating with good pals near the end of an adventure. 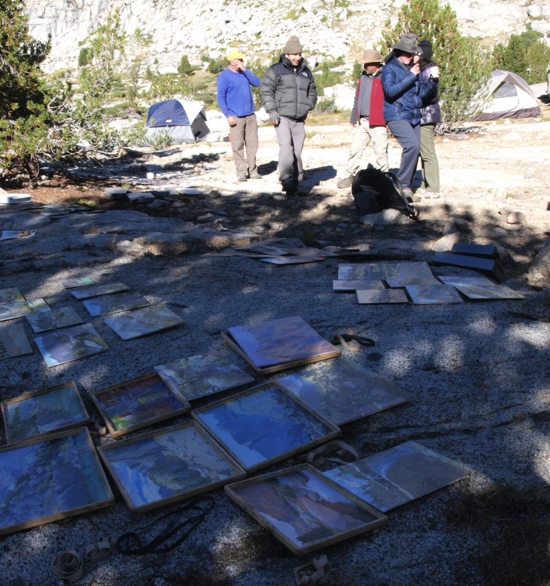 We held a pop up Art show the next morning before we hiked out. It is always a revelation to see the range of work everyone produced. Even when we painted in the same location, we chose different things to paint. Very inspiring. Comparison with the other locations: I do feel that there were scenic elements common to Iceberg, the Nydivers, Ediza, Chickenfoot on the Mt. Morgan side of the lake, and the upper Garnet melt pond area, all within about a 15 minute hike from camp. So, after ten years, there is a lot of familiar territory to be found in a location like this. That is a big plus. The wind was a negative, but it can be dealt with. We had the worst toilet EVER on this trip. It was so bad it was funny, and was a topic of conversation throughout the week. It was a kid sized toilet seat that was loosely duct taped to a milk crate with a garbage bag stuffed below. This getup was sandwiched between two blue plastic tarps that would blow into you whenever a breeze came up. A complete ergonomic and hygienic insult in every possible way at every juncture of the process. I finally resorted to seeking other options a discreet distance from camp that were far more functional and comfortable than this setup.